Great content is the gift that keeps giving, Matt Cutts the Google engineer brainwashed me to believe this and he cannot be wrong because he works for Google! ?You can spend anything from $3 on iwriter.com on content to £XXXX for a piece of content written by a journalist or expert. This post is about how to spend around £190 on content that is world class and will send the right signals to search engines and users alike. Oh it is not just written content, we produced an infograph and branded PDF for this price too! We run a lot of sites and it is not feasible to write all the content for each one. We tend to outsource a lot but at different levels of quality. For this one we needed what was akin to a “thesis” on smoking and life insurance. Who better to write a thesis than a university graduate! We asked around a couple of forums and were recommended a couple of guys that are Oxford Uni graduates and write content for websites to make extra money. Their normal rate was £10 per article but we wanted to get more than a standard £10 article, we wanted more research and depth and as such we put forward the spec of writing a 1000+ word thesis on the topic. They came back with £100 to do it and we were happy to give it a go! The writer we used went to statistics.gov.uk, Google news articles, Wikipedia and various other sources to gather as much in the way of statistics on smoking combined with life insurance as they could find. Any relevant discussions and debates were noted down and a detailed stats document was built in draft form to be used later on. As a past smoker myself, this was not too difficult to get started but they also researched Yahoo answers and forums to see what the general buzz was with smokers and life insurance and what they wanted to know specifically. To take it further you could ask on forums, do free surveys on Linkedin.com or any other way you can find to get feedback. Google discussions search is a great and under used method of finding out what people are talking about in a specific niche, you can set it to find discussions that took place in the last 24 hours or selected time period to get access to the most current debates and questions. Then it was a case of using the quotes and stats that were found in “1)” to provide detailed answers and resources that smokers could visit to get the information they needed. This was down to our designer and coder Shaun. We gave him the spec of creating one big guide akin to how moneysavingexpert.com. This was to please the Google Gods who prefer detailed content in one place and to make it an easy to navigate guide that we could easily transform into a branded PDF document to boot. We cannot take any credit for how well he did this and he suggested we call them “special reports” to give them that edgy/newsy feel. The work done by him to get it on our site and looking great was 2 hours at £15 per hour, a bargain for us! Google Authorship will be growing and growing. What better first step in judging the quality of a document is there than by knowing who wrote it and published it?Also, there were some leaked Google remote rater site quality documents that stated that in medical and financial fields Google like to know that the writer was qualified to write the article. We needed to show Google that we were qualified to publish this content. To do this we got my Google Profile author tags added to the document which in turn added my profile (and scruffy haired pic) underneath it showing i wrote it (or published it in this case!). It also has the advantage of highlighting my profile in the Google search results with the site and as such making it stand out from the other results on that page. The social buttons such as “Share On Facebook”,”Google Plus One” and “Twitter” were also added to allow people to share the content easily if they liked it. If you want to add these easily and free i recommend www.addthis.com. We wanted to make it so that people and sites we promoted this content to would be able to share it easily with their readerships. To do this we firstly made a branded PDF document of the guide that sites could give away. 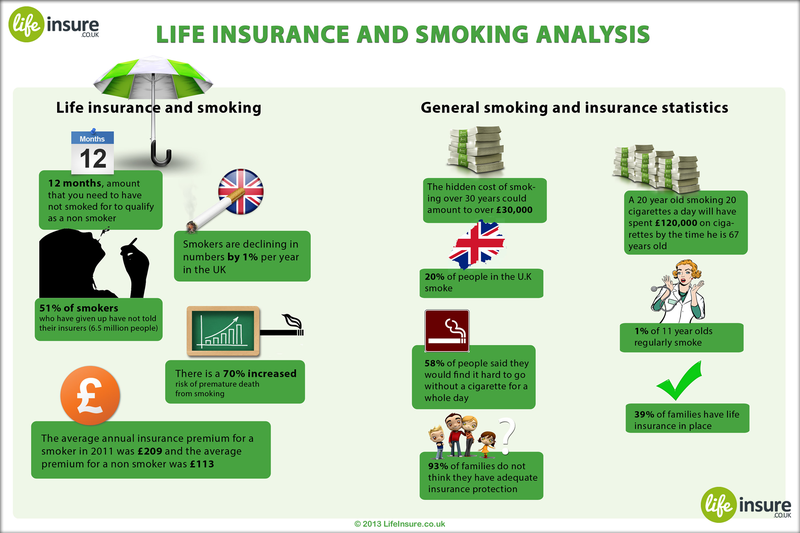 We then made an infograph linked to life insurance for smokers which was more of a visual stimulus for site owners to use to link to the document. We proof read it and got some feedback from unbiased friends and published it when we felt comfortable that we had created the best resource we could have that would stand out from the crowd. You can view the finished content here http://www.lifeinsure.co.uk/special-reports/life-insurance-for-smokers/. In the next article i will show you how this content worked incredibly for us outside of what we might have expected and also what opportunities arose for us from it. The page ranks in Google page 1 for a lot of related terms and that is before we have fully promoted it. I will also do a full article on the promotion process for the third instalment and update on the results of it over the coming weeks. Featured content is so much easier to promote and market. Google uses over 500 ranking signals to determine a site’s position and making amazing featured content will likely tick a lot of boxes. Add to that opportunities outside of Google rankings, which i will come to next, and you can see why doing this properly may have a better ROI than most other forms of SEO.